A really interesting, if not that engaging, look into the potentially dark future of technology. Dr. Will Caster (Depp) is at the forefront of research into artificial intelligence. During one of his presentations a mass terrorist attack is carried out by anti-technology extremists, targeting research centres across the US and causing major casualties. Will Caster is one of the casualties of the attack, and with only a few weeks to live his partner in science and life, Evelyn (Hall), decides to attempt to put his consciousness into the A.I he has created. It is a success, but with his mind put into a machine they start to question the ethics of everything, how much they can control him, and how much he can control them. The idea of the film is really interesting, for me anyway. The idea of artificial intelligence is one that is looked at in many different ways – but ninety percent of the time it involves a ‘human shaped’ body hosting the intelligence (think Ex Machina). However, this film looks at the idea of loading an already human consciousness into software, then letting it free into the world. This story, compared to most sci-fi/future of technology films, also seems to ring most true. The idea of creating robots feels a little Back to the Future to me, but the idea of creating machines that know everything and anything, and are really just a voice, seems to me to be more likely – Like the movie Her (2013) and Siri on iPhones! In terms of the actual film itself, I like the way people chop and change during the film, and how the film changes whose the good guys and whose the bad guys in it all, that’s very intriguing. However I never truly felt drawn in by Transcendence. I’ve seen it twice now, and both times I would end up going off on my own train of thought – thinking about what if this actually happened – rather focusing on the dialogue or events happening on the screen. The acting performances are okay, but the majority of them are just the same old by actors we’ve seen many times. It wouldn’t surprise me if Johnny Depp has been in more films than I’ve seen by now, but I don’t think this performance will be one that necessarily sticks in our heads when we think of him. I’m sure the majority of this is due to how he has been told to act – but his character is cold, lifeless (obviously) and almost completely monotone. Yeah I get that he’s technically an A.I so could have those qualities, but he Is also still his consciousness, and even before he’s put into the machine he is a boring person that I found hard to even sympathise with at some points. Morgan Freeman is the same guy as in the majority of his films, the quiet figure who works out everything first and delivers his findings in his trademark tone – which is excellent to be fair to him, but not anything we haven’t seen before from an accomplished but seasoned actor. The best performance in this film for me was definitely Rebecca Hall as Evelyn, the intelligent wife of Dr. Will caster, who is too in love to see the bigger picture. She injects some much needed passion and emotion into the film and does a good job of conveying the contrasting emotions and worries going around her head from the beginning to the end of Transcendence. This is a fairly well directed film by Wally Pfister, the shots are on point if not always perfect and the special effects in this film are to a real good standard. 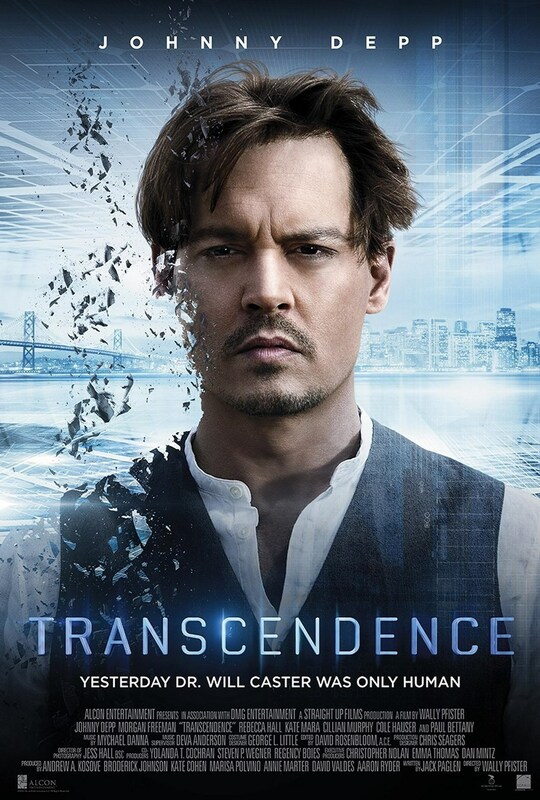 I think there is some improvements that can be made in the shooting and directing of this film, but I’m barking up the same tree as I have for this whole review – Transcendence is crying out for a bit of passion! All in all, it’s a really interesting idea about the dark future of technology, but the film itself is a bit cold. It feels like you’re watching all this through a glass window, and you don’t really feel a part of it. If you’re interested by the idea then watch it, and the idea might stick with you, but the film won’t – which is unfortunate because this really could have been a great movie, with the cast they had and the basic story to go on. ← BAFTA 2015 – Sunday 8th Feburary: LIVE!